SLC this Sat with Desert Noises & Holy Water Buffalo + Recording! Added on May 2, 2013 by Devil Whale. It's time for some news, isn’t it? We haven’t been much in the business of shelling out news the last few months, as we’ve been more in the business of things like winter-dodging, morale repair, personal finance reform, and so forth. But there are two main points to this message, the first being more of the ‘local news’ variety. We have an exciting show this Saturday, May 4, at Urban Lounge. 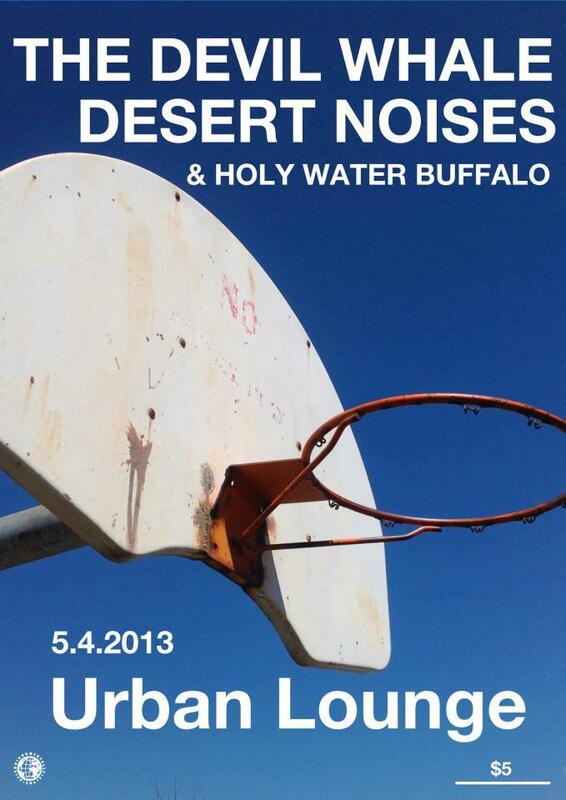 Joining us are two of our favorite(/the best) bands in Utah, Desert Noises and Holy Water Buffalo. Both are full of youth, promise, energy, and hair, and we are big fans! This will be one of the best lineups we will be a part of all year, so if you’re in the area, consider joining us. This brings me to the second point: We’re making a new record! And Saturday’s show will be the last one before we leave for a good chunk of the summer to work on it. That’s exciting, right? It’s been almost exactly two years since we released Teeth, and it’s time for us to expand our discography a bit. As they say, no one likes a thin wiki. In the meantime, we hope to see many of you out this weekend! Shortly thereafter, we’ll be on a journey to complete Phase One. And once we figure out what Phase Two is, we will let you know. As always, thanks for the support!